South Korean President Park Guen-hye reported that she received an assurance from President-elect Donald Trump that the United States will be “steadfast and strong” in its security alliance with South Korea. Park said in a Nov. 10 statement that she spoke with Trump the day after his election and raised the issue of North Korean nuclear weapons advances as the “greatest threat” that both nations face. “We are with you all the way, and we will not waver,” he said, according to the South Korean account of the 10-minute phone conversation. North Korea has violated UN Security Council resolutions prohibiting nuclear and ballistic missile tests over two dozen times this year through November. Experts advise that North Korea will need to be a priority for the new administration, as Pyongyang continues to advance its ballistic missile capabilities and expand its stockpile of fissile material for nuclear weapons. Retired Lt. Gen. Michael Flynn, Trump’s choice for national security adviser, told a group of South Korean officials on Nov. 18 that North Korea would be a top priority for the Trump administration. Trump’s assurance to Park that the United States will be steadfast and strong in its security alliance with Seoul marks a shift in his thinking during the campaign. At various times, Trump raised the prospect of removing U.S. troops from the Korean peninsula, saying South Korea was not paying enough of the costs for U.S. troops stationed there, and suggested that South Korea and Japan may need to develop their own nuclear weapons rather than relying on the United States for security. South Korea currently pays about half of the costs of housing more than 28,000 U.S. troops on the peninsula, but Trump has argued that Seoul should pay a greater share of the expense. The United States used to keep nuclear weapons in South Korea, but removed them in 1991. 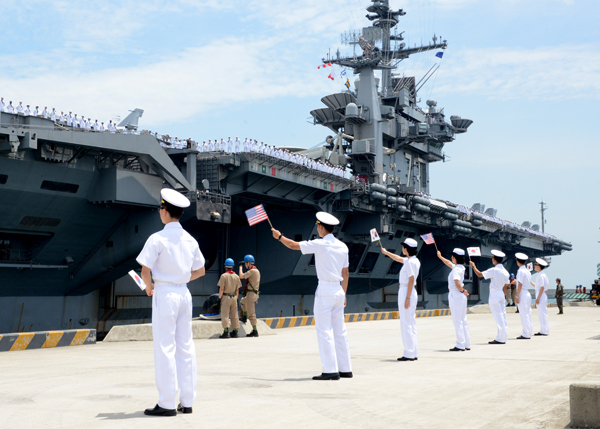 South Korea and Japan are protected by U.S. nuclear weapons as part of Washington’s extended deterrence. Pyongyang has remained relatively silent on Trump’s election, although a week after the voting, North Korea’s state-run Korean Central News Agency (KCNA) implied that Park was using the U.S. election and the “Trump emergency system” to divert attention from the scandal surrounding her own presidency. Protesters are calling on Park to resign after information came to light that she allowed a friend to edit speeches and access sensitive information. A report submitted by South Korea’s unification ministry on Nov. 14 said that Seoul will continue its policy of sanctions and pressure on North Korea during the Trump administration. The Obama administration’s policy included increasing pressure on North Korea through sanctions and engaging in talks with North Korea only after Pyongyang takes steps toward denuclearization. Pyongyang’s defiance tops the issues International Atomic Energy Agency’s annual meeting. Member states of the Inter-national Atomic Energy Agency (IAEA) passed several resolutions at the organization’s yearly meeting, including one that condemns North Korea’s nuclear activities, but did not vote on a controversial resolution singling out Israel’s nuclear program. 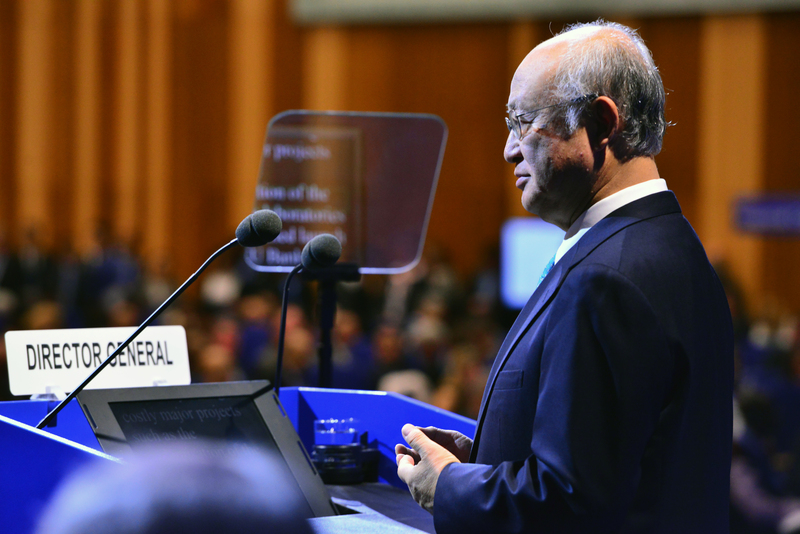 The IAEA’s 60th General Conference was held Sept. 26-30 in Vienna. The agency’s resolution on North Korea was adopted unanimously Sept. 30. 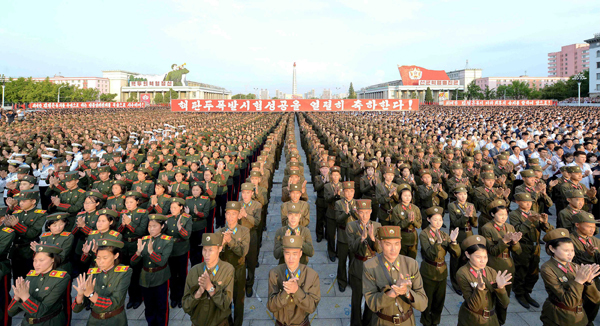 It reaffirmed that North Korea cannot have the status of a nuclear-weapon state under the nuclear Nonproliferation Treaty (NPT) and called on Pyongyang to implement comprehensive safeguards and resolve all outstanding issues that have emerged since agency inspectors were last granted access to North Korea’s nuclear facilities in 2009. North Korea joined the IAEA in 1974, but withdrew in 1994. The agency has not been able to conduct safeguards activities since then, although inspectors had limited periodic access through 2009. In June, the Arab member states of the IAEA made a request to put Israel’s nuclear capabilities on the agenda, but unlike past years did not introduce a resolution on the subject during the conference. Holgate said the United States welcomed the decision by the Arab states and that the resolution singling out Israel was “not an appropriate item” for the conference. In the last decade, the resolution has passed once, in 2009, and was not put forward in 2011 and 2012. It failed to pass in 2010, 2013, and 2014. The member states did approve a resolution on Sept. 29 on the application of safeguards in the Middle East. The measure was approved 122-0, with six abstentions, including the United States. Explaining the U.S. position, Holgate said that efforts to advance toward the creation of a Middle Eastern zone free of weapons of mass destruction have been pursued at IAEA general conferences “without seeking consensus among states in the region” and that this approach undermines trust. The resolution calls on all states in the Middle East to accede to the NPT and accept full-scope IAEA safeguards on their nuclear activities. It also calls on states in the region to take measures toward supporting a nuclear-free zone in the Middle East. The resolution does not specifically single out Israel, but Israel is the only Middle Eastern country not party to the NPT. Israel is suspected of having a nuclear arsenal of about 80 warheads, with enough material for up to 200 weapons, although it has never officially acknowledged possessing such arms or demonstrated its capability through a declared nuclear test. The conference also passed resolutions relating to the agency’s budget, nuclear security work, and technical cooperation. It approved three new applications for IAEA membership for Gambia, St. Lucia, and St. Vincent and the Grenadines. The UN Security Council quickly condemned a missile test, but moves slowly on new sanctions in response to September nuclear test. The UN Security Council issued a statement condemning a North Korean missile test last month, but has yet to pass a resolution in response to the underground nuclear test explosion Pyongyang conducted in September. According to a statement from U.S. Strategic Command, North Korea attempted to launch a Musudan intermediate-range ballistic missile on Oct. 14 from an airfield near Kusong, a city in the northwestern part of the country. The missile exploded shortly after liftoff. The missile has an estimated range of 3,000 kilometers with a 750-kilogram payload. He called on all member states to “redouble their efforts to implement fully” the sanctions imposed on North Korea and reiterated the Security Council’s commitment to finding a way to reduce tensions on the Korean peninsula. Just days after Churkin’s statement, North Korea attempted another launch, presumably of a Musudan. The Oct. 19 test, which also took place near Kusong, failed. 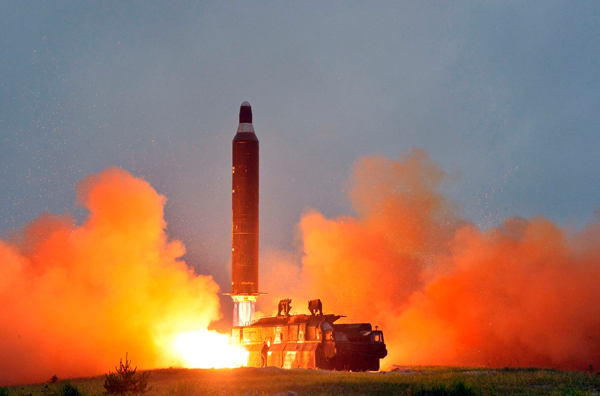 North Korea has tested the Musudan eight times in 2016. Only one launch, in June, was successful. During a trip to Seoul, Samantha Power, U.S. ambassador to the UN, called negotiations over the resolution “intense” and said that there are political and technical issues involved in the talks over new sanctions. Power said that the United States wants a resolution that “makes a substantive difference and changes the calculus over time of the North Korean leadership” and that officials are “working around the clock” to quickly secure passage of a resolution. Power said that the United States has engaged at the highest level with China on the resolution. China and the United States are reportedly at odds over what restrictions to include in the resolution. Secretary of State John Kerry and Defense Secretary Ash Carter met with their South Korean counterparts in Washington on Oct. 19 to discuss a range of issues, including the threat posed by North Korea’s nuclear and missile programs. In a news conference following those talks, South Korean Foreign Minister Yun Byung-se said that Washington and Seoul agreed during the meeting to “use all available tools” to “beef up pressure and sanctions” on North Korea. Yun said that the two countries will “institutionalize the extended deterrence doctrine, which is at the heart of the U.S. commitment to the defense of South Korea.” To accomplish this, Yun said that the four officials agreed to establish a high-level “extended deterrence strategy and consultation group. The top U.S. intelligence official effectively buried the Obama administration’s effort to force North Korea to give up all its nuclear weapons, but in doing so, he opened the way for the next president to pursue a different approach to dealing with Pyongyang. 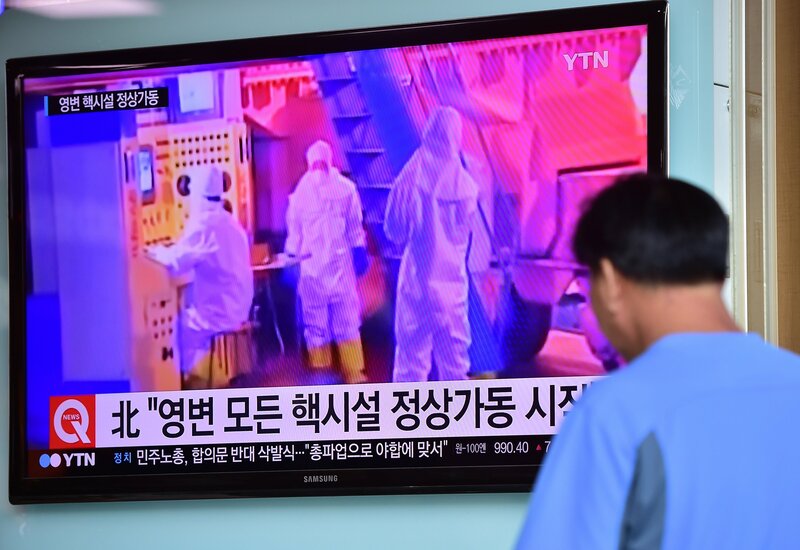 North Korea is thought currently to have enough plutonium for approximately six to eight weapons and the capacity to produce six to eight a year, according to U.S. officials and private analysts. The intelligence community previously assessed that North Korea has been able to develop a warhead that could be mounted on a missile, Clapper said. The six-party negotiations between North Korea and China, Japan, Russia, South Korea, and the United States collapsed in 2009, leaving North Korea to advance its weapons programs. The Obama administration has pursued a policy of “strategic patience,” which includes international sanctions and Chinese diplomacy to induce North Korea to return to denuclearization negotiations. North Korea’s nuclear weapon test explosion September 9 underscores the need to reaffirm the existing global norm against nuclear testing and early entry into force of the Comprehensive Test Ban Treaty. Diplomats at the UN Security Council (UNSC) are engaged in consultations on a proposal from the United States for a council resolution designed to reinforce the existing global norm against nuclear weapons testing established by the 1996 Comprehensive Test Ban Treaty (CTBT). The resolution would be complemented by a separate political statement from the council's five permanent members (P5) further asserting their support for the object and purpose of the treaty. The effort is all the more vital in the wake of North Korea’s fifth nuclear weapon test explosion September 9. The Comprehensive Test Ban Treaty Organization (CTBTO) in Vienna reports that preliminary data from more than two dozen of the seismic stations that are part of their International Monitoring System confirm that the seismic event is in the 5.1 magnitude range, is at very shallow depth, and is in the immediate vicinity of North Korea's Pyunggye-ri test site. Barring unforeseen diplomatic disputes, the UNSC resolution and the P5 statement will likely be approved later this month at UN headquarters in New York. Since then, 183 states have become CTBT signatories and a robust, international monitoring system has been established that can effectively detect and deter clandestine nuclear testing anywhere in the world. The CTBT has near universal support. However, the door to further nuclear testing by North Korea and possibly other countries remains ajar. There are still eight key states—including the United States—that must still ratify the treaty in order to trigger its formal entry into force. Until then, it is clearly in the interests of the United States and the international community to strengthen the taboo against nuclear testing and the work of the CTBTO to maintain and operate the global monitoring system and international data center established to verify compliance with the treaty. Such a statement would give public expression to an existing obligation by the United States, as a signatory to the CTBT that seeks ratification and entry into force, not to take any action that would defeat the object or purpose of the treaty, which is to halt nuclear explosive tests. Unfortunately, some Republicans in the Senate have mistakenly chosen to interpret this common sense initiative as an effort to circumvent the U.S. Senate’s constitutional role by promoting ratification of the CTBT through the United Nations. In reality, presidents do not circumvent the U.S. Constitution by seeking support for treaties at the United Nations; they have done this many times in the past without usurping the Senate’s prerogatives for advice and consent. The resolution would, as UN Security Council Resolution 1887 (2009), annual UN General Assembly resolutions, and national statements at the bi-annual Article XIV Conferences on Facilitating the Entry Into Force of the CTBT have already done before, exhort states to take the steps necessary to ratify the treaty so the treaty can enter into force. Nevertheless, Senate Foreign Relations Committee Chairman Bob Corker (R-Tenn.) convened a hearing of the Senate Foreign Relations Committee September 7 to examine the issue. Sometimes administrations pursue the ratification of treaties negotiated by their predecessors, and sometimes they don’t. For example, the Geneva Protocol banning the use of asphyxiating gases remained on the Senate Calendar for 50 years until the Senate responded to the strong urgings of Presidents Richard Nixon and Gerald Ford to consent to its ratification. The fact that their predecessors did not seek the Senate’s consent did not constitute formal repudiation of the Geneva Protocol, any more than the Bush administration’s lack of interest in the CTBT did. Political statements of intent regarding treaties do not formally release the United States from its Vienna Convention on the Law of Treaties Article XVIII obligation “not to take actions that would defeat the object or purpose” of a treaty Washington has signed. When the Bush administration wanted to formally release the United States from the legal obligations established when President Clinton signed the Rome Statute on the International Criminal Court and the 1972 Anti-Ballistic Missile Treaty with Russia, they did so by formally notifying the depositories. This was not done vis-a-vis the CTBT. Even if political statements by the executive branch during the Bush years provided a sufficient legal basis for releasing the United States from its obligation as a signatory not to take actions that would defeat the object and purpose of the treaty, the Obama administration’s many statements of support for the CTBT and its intention to seek and obtain ratification recommitted the United States to its obligations as a treaty signatory. There is no technical need or military requirement for the resumption of U.S. nuclear testing. If, however, a U.S. president did seek to resume nuclear explosive testing, he/she would need to formally notify the depository that the supreme national interests of the United States require such an action and that the United States no longer intends to seek ratification of the treaty. This would be the case even were there not a P5 political statement expressing the view of the leaders of the P5 about what action(s) would violate the object and purpose of the CTBT. Overall, the resolution and the P5 statement would strengthen the barriers against testing in the years ahead, encourage action by CTBT holdout states to sign and ratify, and reinforce support for the treaty’s nearly complete International Monitoring System to detect and deter clandestine testing. Furthermore, North Korea’s nuclear test should underscore why it is irresponsible for some senators to threaten to cut off funding for the CTBTO’s international monitoring system out of misplaced and overwrought concerns that efforts to strengthen global support for the existing norm against nuclear testing would infringe upon their role in the treaty ratification process. Lost in the legal back-and-forth about executive and legislative branch authorities is the fact that the Senate has not taken a serious look at the CTBT for well over a decade. Much of the skepticism that is expressed by some Republicans is based on outdated information and misconceptions about nuclear testing and the test ban treaty. Much has changed since the Senate last examined the CTBT in 1999 and rejected the treaty after a brief and highly partisan debate that centered on questions about the then-unproven stockpile stewardship program and then-unfinished global test ban monitoring system. A decade and a half later, those programs are fully functioning and have been proven effective. Today, the three U.S. nuclear weapons lab directors report that they are in a better position to maintain the arsenal than they were during the era of nuclear weapons test explosions. No ally or foe questions the lethal power of the U.S. arsenal. All U.S. allies want Washington to ratify the CTBT. Bringing the CTBT back to the Senate for another vote requires a lengthy, intensive educational and outreach campaign by the executive branch to present the new information, answer detailed questions, and dispel misconceptions about the treaty. 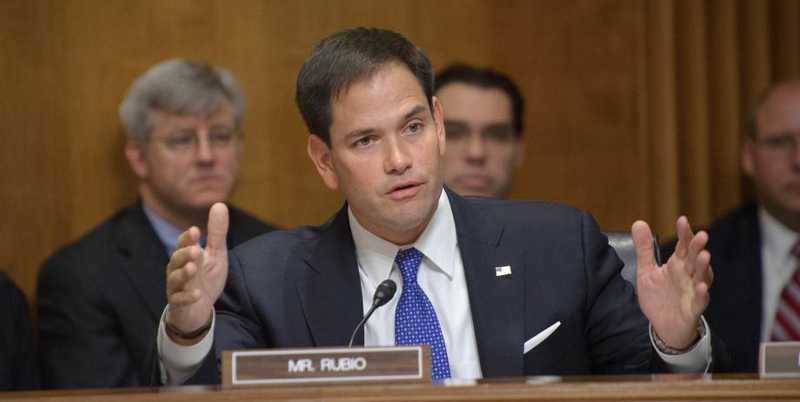 But the process of reconsideration should begin—and soon, with the new president and Senate. Until such time as the U.S. ratifies and the CTBT enters into force, it is common sense U.S. policy to strengthen the barriers against nuclear testing by others. North Korea issued a statement redefining denuclearization, but new U.S. sanctions likely closed off any opportunity to test Pyongyang’s intentions, according to experts. North Korea has publicly redefined its denuclearization policy, a move that some experts say may have been intended as an overture to resume nuclear negotiations until the U.S. decision to sanction the North Korean leadership likely closed off any opportunity for new talks. 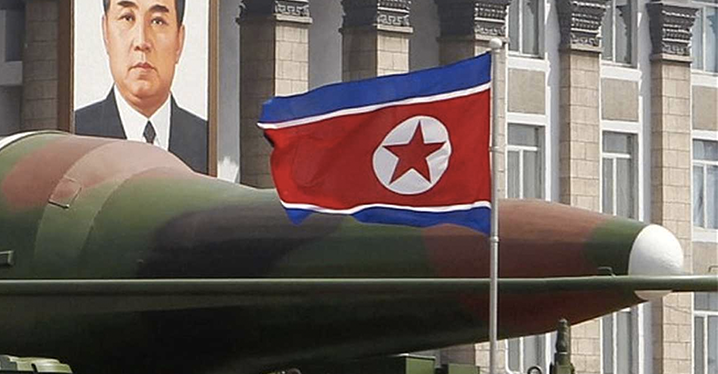 North Korea is estimated to possess approximately six to eight plutonium-based warheads. South Korea does not have nuclear weapons, and the last U.S. tactical nuclear weapons deployed in South Korea were withdrawn in 1991. Robert Carlin, a former U.S. State Department senior policy adviser to the special ambassador for talks with North Korea, said the statement marked a change from North Korea’s past characterizations of denuclearization, which stated that Pyongyang would give up its nuclear weapons only when countries such as the United States disarm. Carlin, speaking at a July 13 press briefing hosted by the U.S.-Korea Institute at Johns Hopkins University, said that the new position, which called only for denuclearization of the Korean peninsula, is more practical and “clearly and very deliberately” lays out a definition of denuclearization similar to North Korea’s position in the 1990s, when the two Koreas signed a joint denuclearization agreement for the Korean peninsula. Yet, just hours after Pyongyang’s statement, the U.S. Treasury Department imposed financial sanctions on North Korean leader Kim Jong Un and several senior officials because of human rights violations. This was the first time that the United States directly targeted the North Korean leader. The sanctions imposed by the United States are a “dialogue killer,” said Joseph DeThomas, a former U.S. deputy assistant secretary of state for nonproliferation, at the July 13 press briefing. Sanctioning Kim was a “major step” because states do not take lightly such a decision against a foreign leader, and it is unlikely that he would have been targeted personally if the United States was interested in negotiations at that time, DeThomas said. Pyongyang responded July 11 by saying in its state-run central news agency that it would cut off communication with the United States after Washington “impaired the dignity” of North Korea’s leadership by imposing sanctions. North Korea and the United States do not have diplomatic relations, but communicate via the so-called New York channel at the United Nations. North Korea said it cut off the channel after the United States refused to drop the sanctions. In its July 6 statement, North Korea cited five specific demands for achieving denuclearization on the peninsula: public disclosure of U.S. nuclear weapons in South Korea, removal and verification that such weapons are not present on U.S. bases in South Korea, U.S. guarantees that it will not redeploy nuclear weapons in South Korea, U.S. assurances that it will not threaten or conduct a nuclear strike on North Korea, and withdrawal from South Korea of U.S. troops authorized to use nuclear weapons. North Korea said it would take “corresponding measures” if the United States satisfies its conditions. By invoking the names of past leaders Kim Jong Il and Kim Il Sung in the statement, Carlin said North Korea was signaling that this position comes from the highest authority and that Kim was putting himself behind denuclearization. Carlin said that there are clear similarities between these points and the 1992 joint denuclearization declaration between North Korea and South Korea and that the United States has met or generally agreed to meet the first four of the five North Korean demands. It is difficult to tell if North Korea’s offer will be completely abandoned or remain available for consideration after Pyongyang’s outrage about the sanctions dies down, Carlin said. Yukiya Amano, director-general of the International Atomic Energy Agency (IAEA), last month completed his yearly report on the application of IAEA safeguards in North Korea for the agency’s General Conference and Board of Governors meetings. IAEA inspectors have not been in North Korea since 2009, but the agency continues to monitor Pyongyang’s nuclear activities through such means as satellite imagery and submits a report on any developments ahead of the IAEA General Conference, which is scheduled for Sept. 26-30. North Korea shut down the reactor in 2007, but restarted it in 2013. In the past, North Korea separated plutonium from the spent reactor fuel to provide fissile material for its nuclear warheads. The Radiochemical Laboratory was used in the past to reprocess spent fuel from the reactor at Yongbyon. If a full load of spent fuel from the reactor was reprocessed, it could yield enough separated plutonium for two to four nuclear warheads. The IAEA report called on North Korea to cooperate with the agency and resume full implementation of its safeguards agreement.